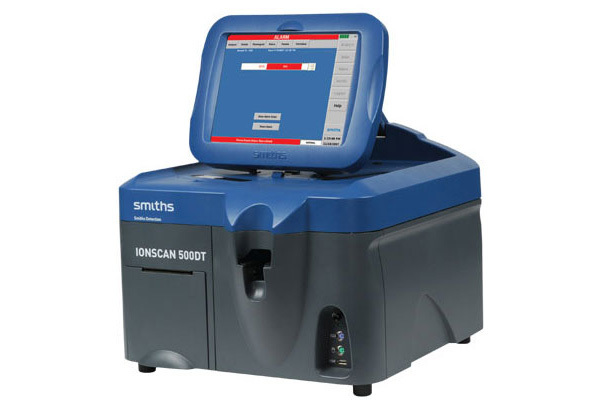 The IONSCAN 500DT fills the growing need of security professionals to have the ability to detect a wide range of substances and to be able to adapt as threats and their needs change. This dual detector system is ideal for any security application. Aviation security personnel and the military will benefit from the capability to detect a much broader range of explosive substances. Customs, coast guard and border crossing agencies that require the ability to detect both narcotics and explosives from a single sample will be able to execute their duties utilizing one instrument. Facility security professionals will be aided in better protecting access points to commercial buildings, courthouses and correctional facilities, with the ability to detect multiple threats with one instrument. Building on the success and trusted technology of the IONSCAN family of trace detectors, the IONSCAN 500DT has an ergonomic design and a large, color touch‑screen display, built-in printer and 40GB internal hard drive. Further advancements include full PC functionality, increased memory and networking capabilities. The IMS detectors in the IONSCAN 500DT are the same as in the IONSCAN 400B, of which over 6000 are in use by aviation security, government and law enforcement agencies, the military and by private security companies. An advanced sampling wand eliminates the need for the operator to handle the sample swab after every sample. This increases the quality of the sample collected and analyzed, further enhancing the performance of the IONSCAN 500DT. The IONSCAN 500DT includes a regenerative Air Purification System (APS), which reduces maintenance and cost of ownership. In addition, most operator replaceable parts do not require the use of tools in the field. The IONSCAN 500DT utilizes specially developed proprietary software. The operator navigates through the software using the large, color touch-screen display. The large size and color-coded interface of the display makes it easy to view results and operate the IONSCAN 500DT. With the increased internal memory, more analysis results can be stored. These results can be printed with the built-in printer and exported via the USB port. The software also allows advanced operators the capacity to further review and analyze results.